(TBGB9Z) Travel Bug Dog Tag - Coaster Coast. Use TBGB9Z to reference this item. I sensed there was something amiss in the kitchen. Then, the details emerged. One of my coasters, sick of the tired old routine of always holding my ginger beer, wanted to get out and see the world. Travel coast to coast, see more beverages, see more places. 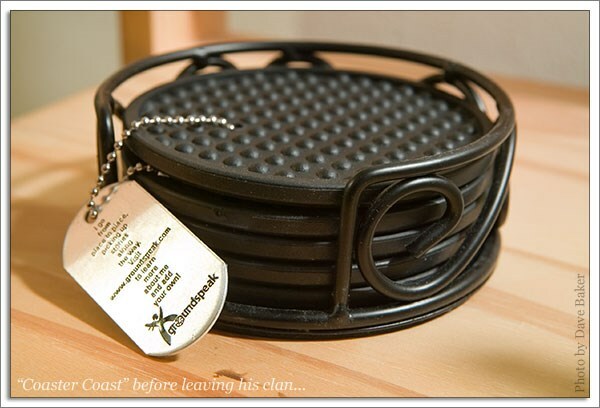 "At least take a dog tag! ", I pleaded, before he left. Please take this travel bug coast to coast (we'll start by sending him to California, please), and if you care to, take a photo of him holding up your favourite beverage. Gallery Images related to Coaster Coast. "Coaster Coast", before leaving his clan. This entry was edited by devbrain on Monday, 28 March 2011 at 23:00:14 UTC. Coaster Coast. is now with ThePack! Found this TB hanging out at GCMF7M. I will move him along with me to Virginia in a few weeks.